Fully adjustable keyboard tray promotes neutral hand/wrist position with height and tilt indicators that let you customize keyboard tray settings. Comfort-Lift system lets you slide mouse platform left or right over keyboard numeric pad and offers two custom height positions. 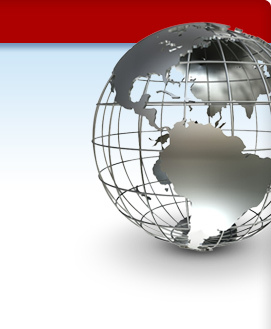 Mouse platform tilts forward or backward and adjusts up or down to height of keyboard. Mouse platform tilts forward or backward and adjusts up or down to height of keyboard. Mousing surface mounts on the left or right of the keyboard. Warning Trak helps prevent mouse from sliding off mousing platform. Lift and lock feature lets you adjust height with one hand. 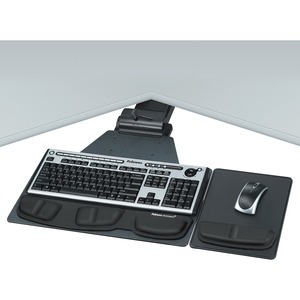 The durable keyboard platform with soft gel wrist support fits most corner and standard workstations. Health-V memory foam supports with Microban antimicrobial protection. Track length measures 25"". Platform measures 19"" x14-3/4"". Tray meets or exceeds applicable ANSI/BIFMA standards.